The dogs and I headed back to the Blue Ridge Parkway to continue south to the border of Virginia and North Carolina before jumping off to visit parts of eastern Tennessee. 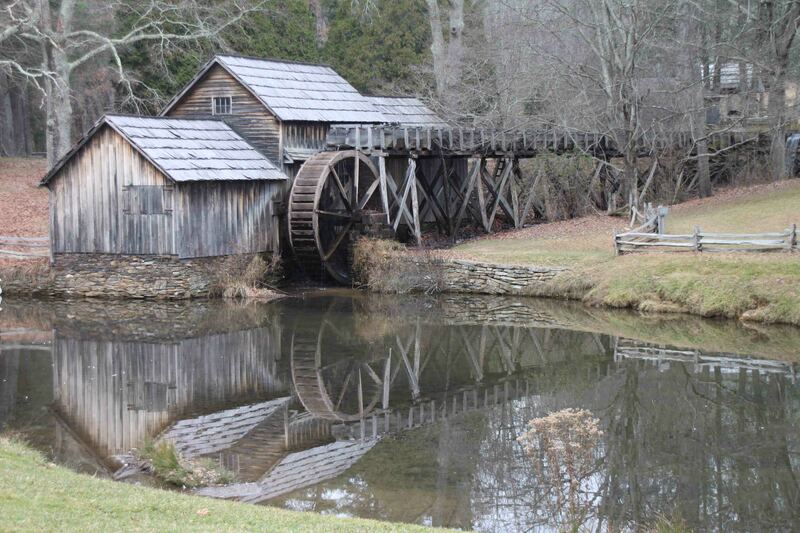 The next two stops on the Parkway included Smart View and Mabry Mill. Reader’s Digest explains the names of each stop fit the description mountain folk applied ages ago. Given all the stunning views I enjoyed yesterday, I couldn’t imagine what a right, smart view would include. 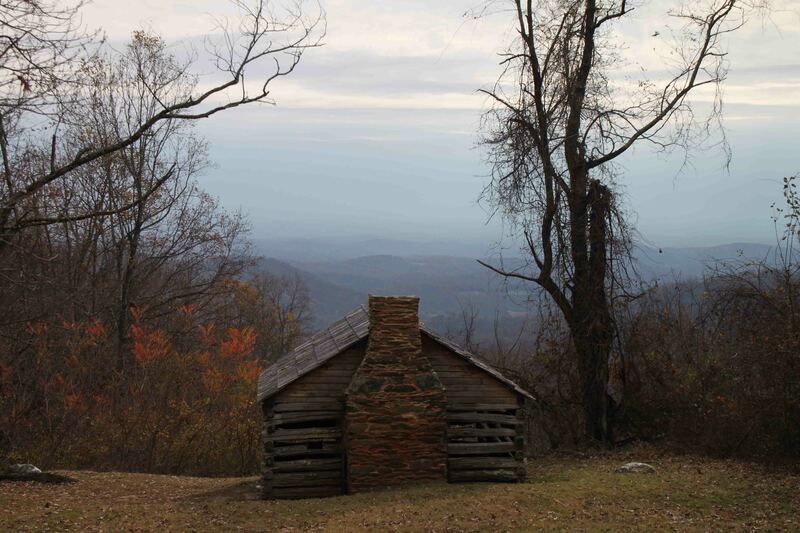 In this instance, I was taken more to the view of the old, log cabin perched on the hillside than the vast vista of mountains beyond. 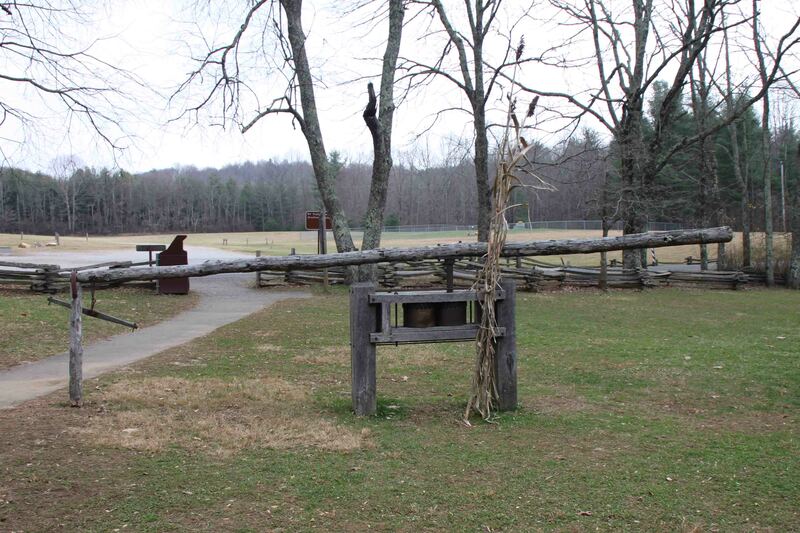 After a short walk around the picnic area, the dogs and I moved on to Mabry Mill. From 1910 to 1935, Ed Mabry ran the mill, a blacksmith shop, and a woodworking shop just to name a few of the businesses that contributed to his reputation as the man that could “fix most anything”. The mill building, separated into three sections, housed a sawmill, a gristmill, and a woodworking shop. 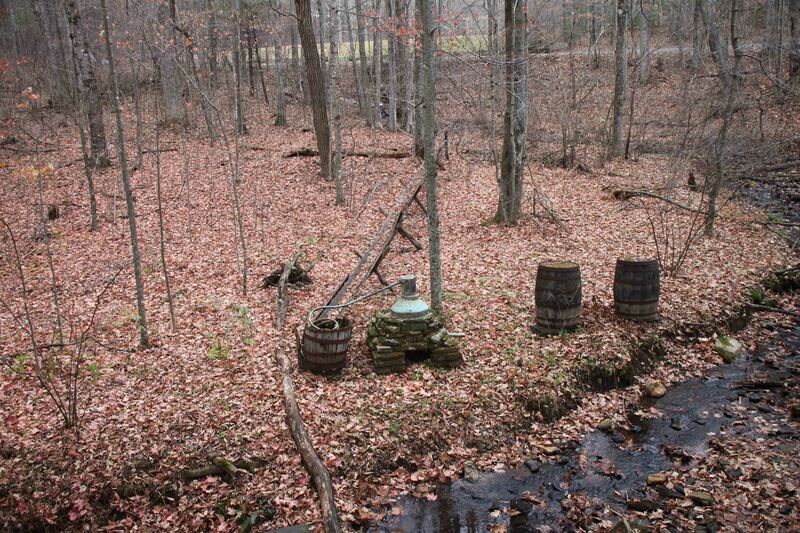 In the gristmill, Mabry only ground corn as opposed to some of his competitors which also ground wheat. 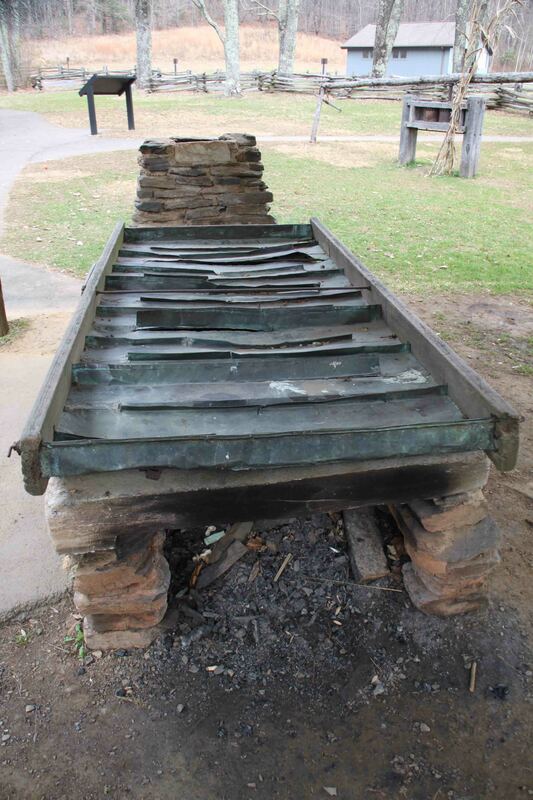 He used his sawmill during the rainy times when the water flow increased and used his jigsaw and other tools in the woodworking shop to produce wagon wheels. The site also included a whisky still to brew moonshine and a mule powered sorghum mill and evaporator used to yield molasses. I found these items interesting as I had never seen the apparatus. Next to each display a sign documented the production process. To make moonshine, cornmeal, malt, and sugar are mixed with water and fermented in barrels for several days to almost two weeks. The fermented mash (beer) is heated in the copper still. The vapor is then transferred to a flake stand which contains a spiral tube (also known as the worm) that is immersed in a constant flow of water. The worm condenses the vapor into liquid which flows into another barrel to hold the corn whiskey. Sorghum molasses became popular during the Civil War when sugar and corn syrup supplies diminished. A mule, attached to a ten foot sweep, walks in a circle to operate the rollers to which stalks are fed. The rollers extract a bright green juice that is strained and then cooked for several hours in an evaporator. Ten gallons of juice produce one gallon of syrup which is bottled once it reaches the proper consistency. The morning was also the last of the sunlight, as the afternoon brought thick thunder clouds and rain. The mutts accompanied me through two hours of rain past the first few stops I planned to make in Tennessee, including Watauga Lake and Cherokee National Forest. Given my recent luck with National forests, the rain was probably a blessing! And as for the lake, the magical setting created by low hanging clouds over a jade colored water surrounded by mountains was in perfect view through VANilla’s passenger window. While searching for the next Walmart in Elizabethton, I stumbled across a historic site that I plan to visit in the morning. In the meantime, I enjoyed a spinach salad at Fatz Café before camping in the parking lot for the night.